Diagnosis: Ankle Sprain Physical Therapy in Grapevine. Treatment: Ankle Sprain Physical Therapy in Grapevine. 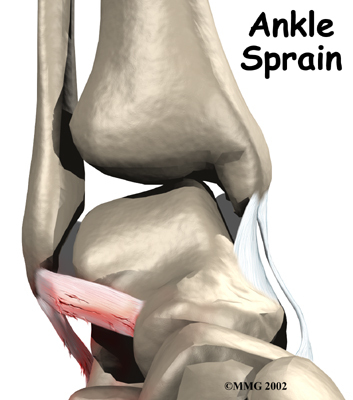 Welcome to Grapevine Physical Therapy & Sports Medicine's patient resource about ankle sprain and instability. Following an assessment your Physical Therapist at Grapevine Physical Therapy & Sports Medicine will advise you of the findings and create an individualized therapy program. He or she may request additional testing to help define the true nature of your injury. Below is a guideline of what you might expect during rehabilitation for an ankle injury. When you visit Grapevine Physical Therapy & Sports Medicine, we will do a physical examination to evaluate the injury and determine which ligament has been injured. Our Physical Therapist will move your ankle in different positions in order to check the ligaments and other soft tissues around the ankle. Some of our tests involve placing stress directly on the ankle ligaments to see if the ankle has become unstable and to find out if one or more ligaments have been partially or completely torn. If a complete rupture of the ligaments is suspected, our therapist may refer you to a doctor for stress X-rays. Even if you don't need surgery, you will likely need to follow a program of rehabilitation and exercise for your ankle injury. When you visit Grapevine Physical Therapy & Sports Medicine for Physical Therapy in Grapevine, we can create a program to help you regain ankle function. It is very important to improve strength and coordination in the ankle. Swelling and pain are treated with modalities like ice or electrical stimulation. If swelling in the ankle is severe, our therapist may also apply massage strokes from the ankle toward the knee with your leg kept in an elevated position. This helps get the excess tissue fluid moving out of the ankle and back into circulation. Your Physical Therapist may issue a compression wrap and instruct you to wrap your ankle and lower limb and to elevate your leg. Many of the specific nonsurgical treatment options that we use at Grapevine Physical Therapy & Sports Medicine depend on whether your problem is an ankle sprain or ankle instability. The best results after an ankle sprain come when treatment is started right away. Our Physical Therapists will use treatments to stop the swelling, ease pain, and protect the injured ankle from weight-bearing activities. A simple way to remember the essential steps of initial treatment is by the letters in the word RICE. These stand for rest, ice, compression, and elevation. Our Physical Therapists may also apply specific hands-on treatment called joint mobilization to improve normal joint motion. 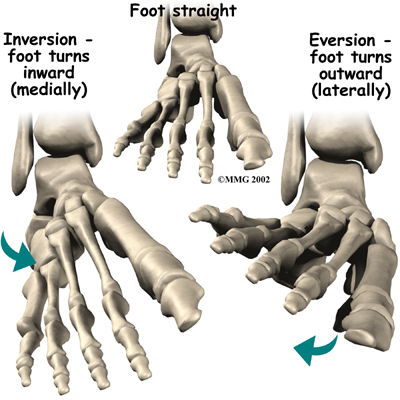 These treatments restore the natural gliding motion between the ankle bones that may be restricted following injury. This form of treatment speeds healing and improves function after an ankle sprain. It may also help clients to return more quickly to their activity or sport. 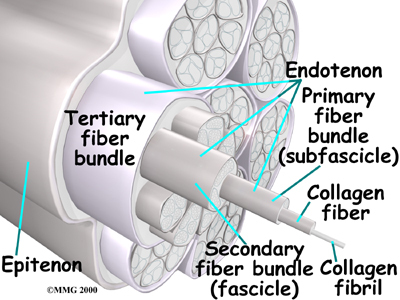 Small nerve sensors inside the ligament are injured when a ligament is stretched or torn. These nerve sensors give your brain information about the position of your joints, a sensation called proprioception or position sense. For example, nerve sensors in your arm and hand give you the ability to touch your nose when your eyes are closed. 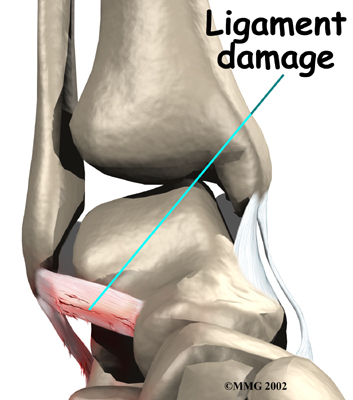 The ligaments in the ankle work the same way. 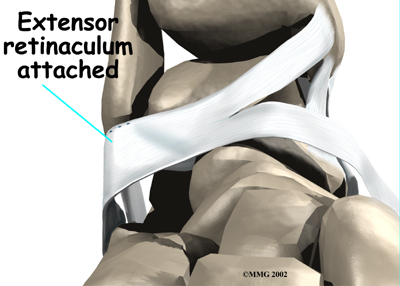 They send information to your nervous system to alert you about the position of your ankle joint. Our Physical Therapist will help you retrain your position sense as a way to steady the ankle joint and protect you from spraining your ankle again. Your Physical Therapist may also recommend medications. Mild pain relievers may help with the discomfort. Anti-inflammatory medications can help ease pain and swelling and get people back to activity sooner after an ankle sprain. These medications include common over-the-counter drugs such as ibuprofen. Talk to your doctor or pharmacist if you have specific questions about which pain reliever is right for you. As treatment progresses, our Physical Therapist will have you gradually begin putting weight through the joint. Casts are uncommon unless the sprain is very severe or the ankle is broken because soft tissues weaken when they are kept immobile. 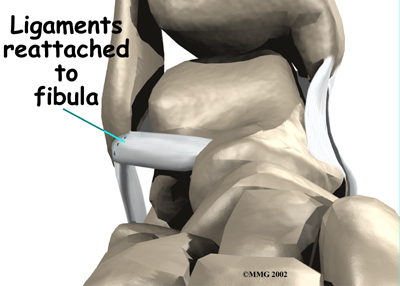 Braces are available that can be worn to support the ankle, but still allow weight bearing. These are the most popular treatment for helping reduce strain on the healing tissues. When you get full ankle movement, your ankle isn't swelling, and your strength is improving, our Physical Therapist will help you gradually get back to your work and sport activities. We may issue an ankle brace for athletes who intend to return quickly to their sport. 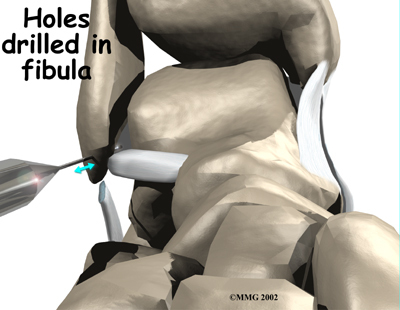 If the ankle ligaments do not heal adequately, you may end up with ankle instability. This can cause the ankle to give way and feel untrustworthy on uneven terrain. If your ankle ligaments do not heal adequately following an ankle sprain, your Physical Therapist may suggest several things. Physical Therapy treatments at Grapevine Physical Therapy & Sports Medicine will likely be initiated to help restore joint range of motion, strength, and joint stability. Many people who have ankle instability have weakness in the muscles along the outside of the leg and ankle. 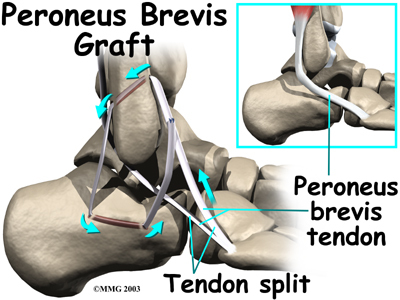 These are called the peroneal muscles. Our Physical Therapist can teach you strengthening exercises for these muscles to help you control the ankle joint and improve joint position sense. 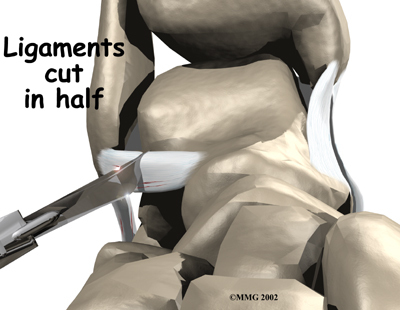 Patients usually take part in formal Physical Therapy after surgery. Rehabilitation after surgery can be a slow process. Although the time required for recovery varies, as a general guideline you should expect to attend Physical Therapy sessions for two to three months, and should expect full recovery to occur over six months. Your first few Physical Therapy treatments are designed to help control pain and swelling from the surgery. Our Physical Therapist may use ice and electrical stimulation treatments during your first few therapy sessions, progressing to massage and other hands-on treatments to ease muscle spasm and pain. Our Physical Therapist will use treatments to help improve your ankle range of motion without putting too much strain on the healing ligaments. After about six weeks we may have you begin doing more active exercise. Exercises are used to improve the strength in the peroneal muscles. Our Physical Therapist in Grapevine will also help you retrain position sense in the ankle joint to improve the stability of the joint. At Grapevine Physical Therapy & Sports Medicine, our goal is to help you keep your pain under control, improve range of motion, and maximize strength and control in your ankle. When your recovery is well under way, regular visits to our office will end. Although we will continue to be a resource, you will be in charge of doing your exercises as part of an ongoing home program. Grapevine Physical Therapy & Sports Medicine provides Physical Therapy in Grapevine. 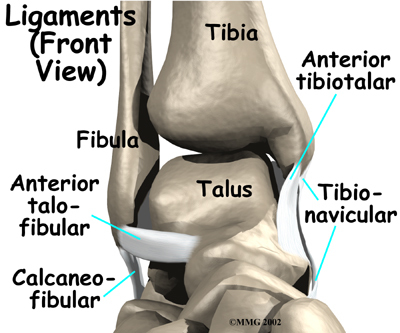 If a complete rupture of the ligaments is suspected, you may need to see a doctor for stress X-rays. These X-rays are taken while the ligaments are placed in a stretched position. 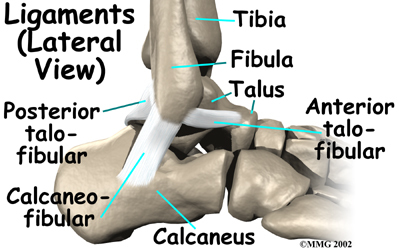 The X-ray will show a slight tilt in the ankle bone if the ligaments have been torn.